There is only a few area remaining to burnish. 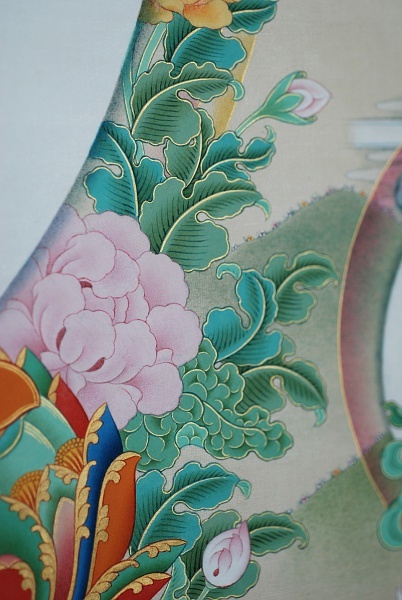 This is the eight auspicious symbols. 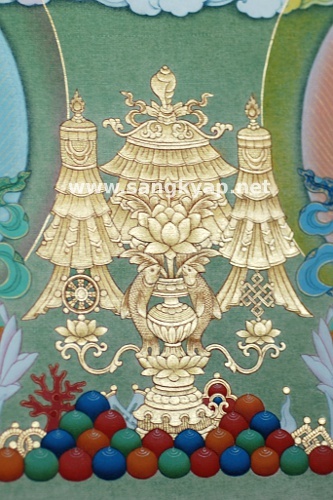 The parasol, the golden fishes, the treasure vase, the conch shell, the endless knot, the victory banner and the wheel of Dharma. Here these eight symbols are put together as an offering and burnished with shading effect by controlling the pressure of the burnishing stone. 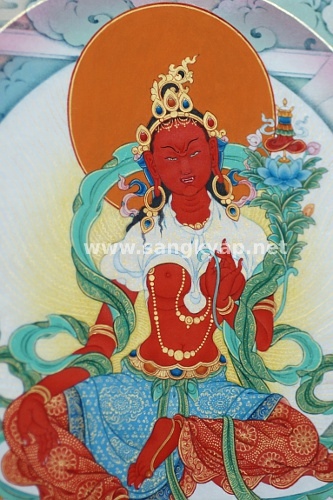 I could just quickly burnish it without the shading which is more commnly seen in the thangka of Karma Gardri style and that was I was thinking to do initially. 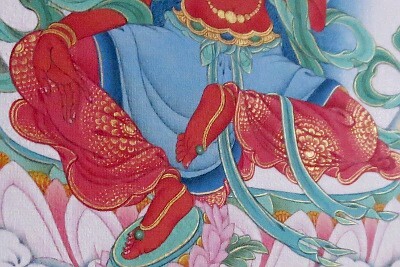 Somehow I feel that maybe I unconsciously choose more time consuming method in order to stay working on this thangka. Anyway, the remain part to burnish gold now is only for the main Grenn Tara. 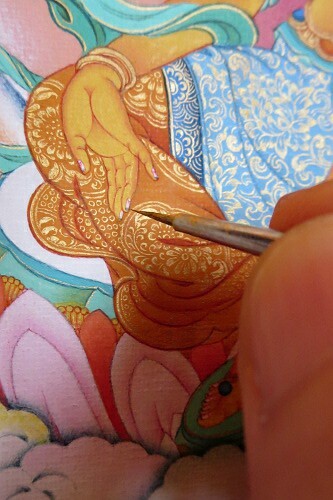 Burnishing the areas where are painted with gold. Mainly the ornaments or some of the offerings. 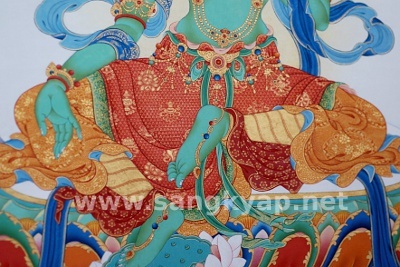 We don't burnish every areas and where to burnish is depend on each painter and the tradition he follows. 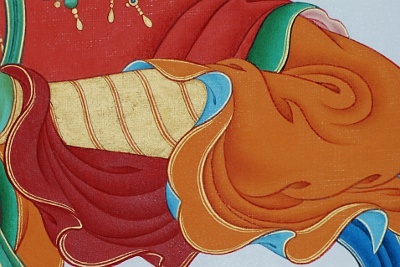 For example, I don't burnish the gold patterns on the garments or the light rays on the nimbuses while some other painter do burnish these areas. 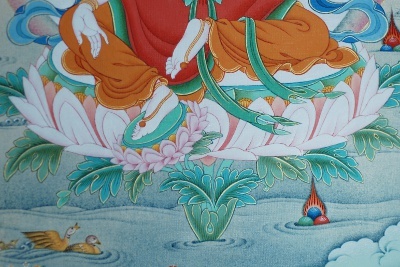 Following the gold pastern in the deity's garments, I've started the aura lines on the nimbus behind the deities. 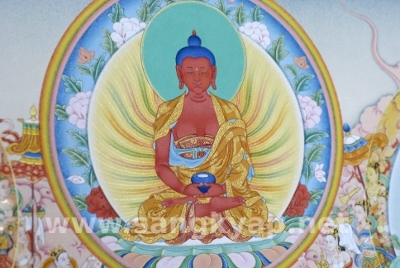 The aura from the body of deities are described with two different lines. Solid lines and wavy lines. I usually make gently curved solid lines first. 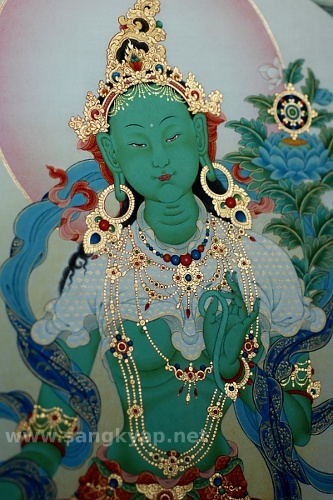 I've started to paint the gold pattern for the main figure, Green Tara. 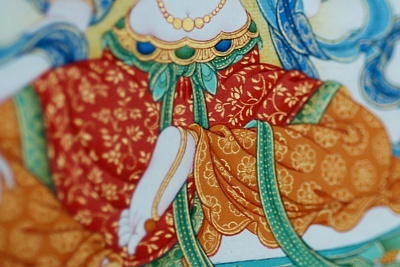 Though the Thangka painters need to follow some "rules" to paint Thangkas, the proportion of the deities, the hand gesture, attributes,,etc,,,etc, painting gold pattern is one of the few stages where the painter have more freedom. It can be done very quickly and easily just by filling up the space with simple pattern. But it will be, Of course, much more beautiful and will show the dignity of the deities with time consuming but finely made gold pattern. What is important is the quality time of the process. 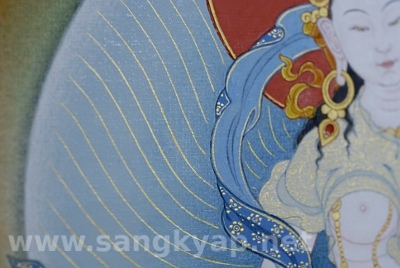 There is the completion of the painting at the end of process just as a result. 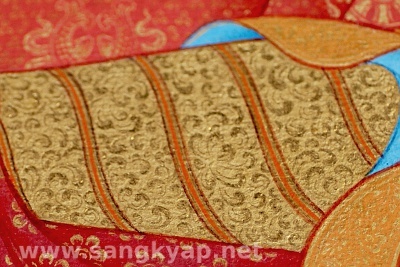 The second half of the gold detail for small Taras. 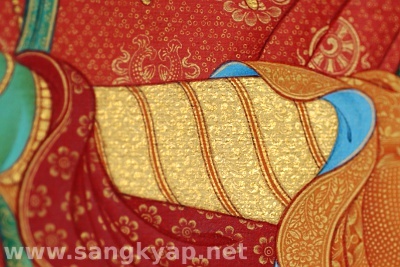 The gold detail for the cloth of Taras. The postscript of the last post about the fish glue. 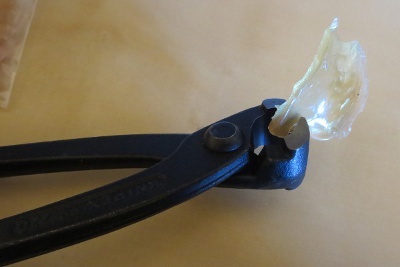 I've received a message from Mr. Fujioka, saying "The white things floating in the glue solution may be dissolved if you heat more but then it might decrease the adhesive power. So it is the best to filter it." And here I didn't wait this message and was using the glue without filtering. I saw something,,,slimy?,,,runny transparent substance went in the pot! I can't just remove the slimy things out of pot. If I do that I'll lose a lot of gold. I should pour some warm water into the pot, mix well, wait till the gold settle on the bottom of the pot and throw away the water,,,continue this several times. Being lazy for small work caused me to lose a lot of time and the precious gold. I'll just filter it well for the next time. Anyway, the work is going on with new gold I prepared in another pot. I've recovered from my cold and am regaining the usual daily rhythm. I've gotten several new painting supplies during my short stay in Japan. One of them is the glue made from fish. I was recommended this glue specially to use with gold and I've decided to try it out as I'm just painting my recent Thangka with gold. You may not know what is this "Glue". 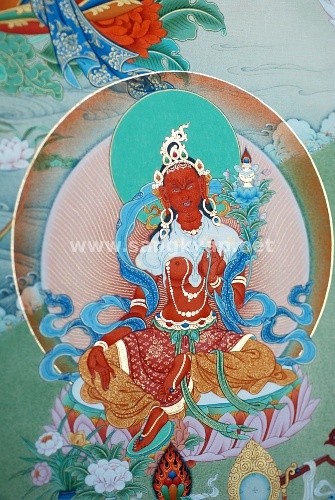 The color pigment I use to paint Thangka is mostly finely crushed natural stones. 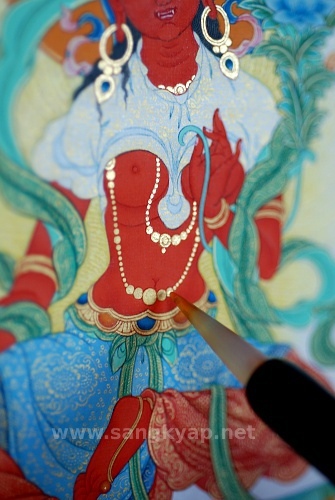 The "glue" is used as binder to fix these powder like pigment on the canvas by mixing with it. It is very important to choose good glue, know the right concentration and how to use it because these affect the brilliancy of the color and the fixing power. 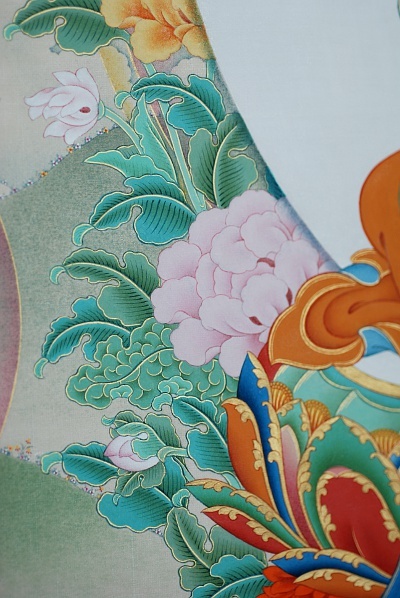 In other words, it affect the "light" of the color at present and also the "life span" of the paint. 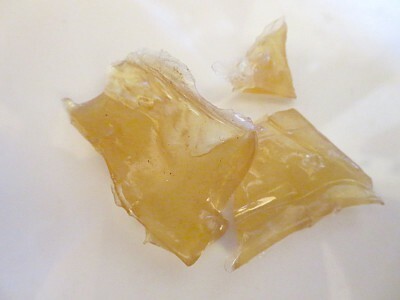 The color of this fish glue looks much clean and transparent compare to the hide glue from cow or water buffalo which I usually use. I don't use much glue at a time, it's usually less than 1g so first I have to crush it and then soak in warm water. It's quite difficult to cut or crush as it is hard and also resilient. 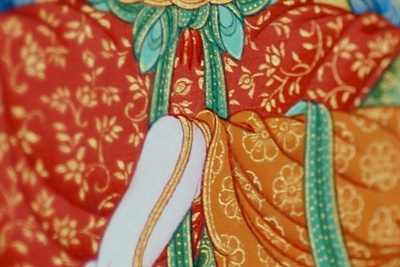 Begin to work on the clothing of the deities with gold. Since I use the different brush to paint small patterns and long line, start with the long and thin lines such as border of the clothing and the halo around the head and body.